After you get your Facebook cover and Profile pictures positioned where you want them, optimize the cover image before you upload it to Facebook in the steps that follow. Remember that your cover image needs to first be cropped to 1702 x 630 px. Use the guidelines in the template, or crop right along the edge of the Facebook frame around the cover image to crop just the cover image. If you have trouble getting the cover image cropped exactly to 1702 x 630 px, enlarge the image in the workspace so that you can more precisely control the Crop tool. You can also use the Canvas Size dialog box to adjust the exact size of the cover image. 1Click the small eye icon next to each layer in the Layers panel to turn off all the layers except the layer with the cover image. 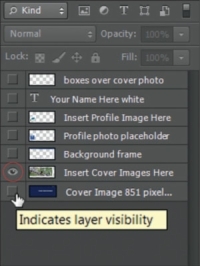 When you finish turning off all the other layers, only the cover image will be visible in the workspace. The Save for Web dialog opens. In previous versions of Photoshop, this dialog was called Save for Web & Devices. The name may be different in different versions, but the dialog box itself and its features have not changed. 3Choose JPEG or PNG from the Image Format drop-down list. If the image is a photograph or other image with millions of colors, choose JPEG. If the image is a logo or cartoon that uses fewer colors, choose PNG. 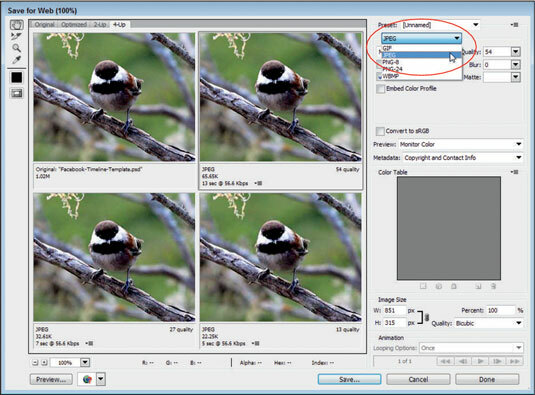 4If you choose the JPEG format, adjust the quality settings to apply compression and reduce the image size. If you choose the PNG format, reduce the number of colors. You want to make sure that your picture loads properly when someone visits your profile. 5After you get the settings the way you want, click Save As, and then give the image a new name. A copy of the image is saved, the Save for Web dialog box closes, and the cover image is ready to be uploaded to Facebook.